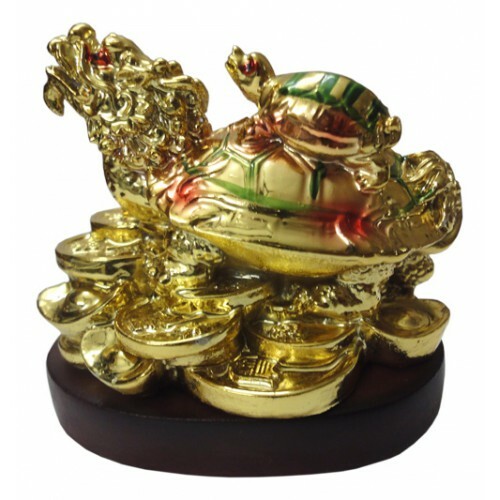 Dragon Turtle Feng Shui Symbol with a Baby Tortoies on its backDragon Turtle sitting on bed of ..
Dragon Turtle sitting on bed of coins and ingots is a symbol of good luck, longevity, protection, harmony and money in Feng Shui. Dragon Turtle is a Chinese legendary symbol with the head of dragon and the body of turtle and thereby is a combination of the 2 out of 4 celestial animals of Chinese mythology .It has a coin in its mouth and a baby tortoise on its back. The Dragon Headed Turtle with a baby of its back while standing on a pile of coins represents a new business venture with prospects. The symbolic meanings of the animals are dragon (luck); tortoise (long life), baby tortoise (new beginnings, fertility or excellent descendants luck) and the Coins represent the Money that can be made. The dragon is said to be blowing good breathe to people and carrying Yi which signifies power, high rank and doing everything well. The ideal placement of the Dragon Turtle Feng Shui Symbol would be in the North or East sector of the house. Placing this dragon at home is said to bring the occupants of a home good luck, wealth and feeling of security. The Dragon Headed Turtle also protects a home from negative energies. Do not put the symbol in the North or East if it is directly in front of you while putting it at Office or Business place.